Here is a link to my newsletter that went out last night - CLICK HERE. In it you will find details regarding the Cyberweek Sale that starts this morning, the NEW PLANNER release and so much more! Contact me if you have any questions! WOOHOO! 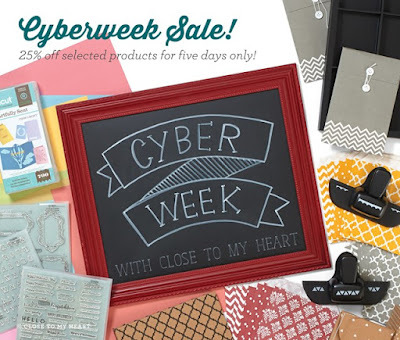 Close To My Heart is getting ready for an amazing Cyberweek SALE! For five days only, from 9 am MST on Monday, November 30 through 4 pm MST on Friday, December 4, there will be nearly 40 items offered at an incredible 25% off retail price! 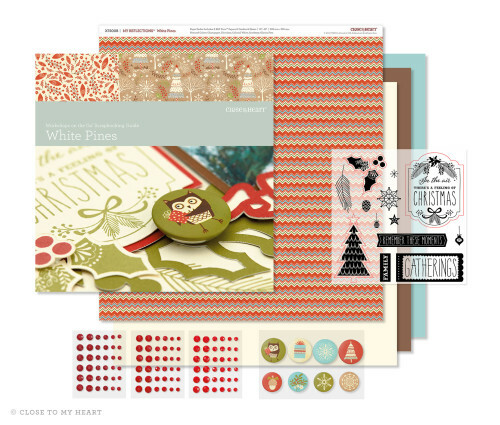 The items selected are all especially suited to making handcrafted gifts and cards for the holidays - including our Cricut Artfully Sent collection! All items will be available in a special shopping category on my website. There are thirty-nine products included in this sale, which come from our current idea books. Their item numbers are listed below. Additionally, all items will be shown in a special shopping menu entitled “Cyberweek Sale!” on your Online Business Address. This is simply phenomenal, unique and one-time special offer! How many items are on your list just from seeing what is on special?! Mine is pretty long! LOL They are things I have needed/wanted but haven't ordered. There is no better time to get them! IF YOU WILL ORDER $150 OR MORE ON YOUR OWN, CONTACT ME DIRECTLY ASAP - at mlisrobinson@gmail.com - and let's get you your own party established (even if you are the only one to order from it) so you can collect at least $25 in FREE products. If you know of a few friends who would also like to order, consider having them submit their order through your party to increase your hostess rewards. Just contact me ASAP so we can get things set up in advance of the sale starting so nobody misses out on the product they have their eyes on. I will post this information again on the night of November 29th so you are sure to take advantage of Cyber Week with Close To My Heart! I cannot wait! How about you?! Ooh...and don't forget, our fabulous planner goes live on December 1st! You can find details here. 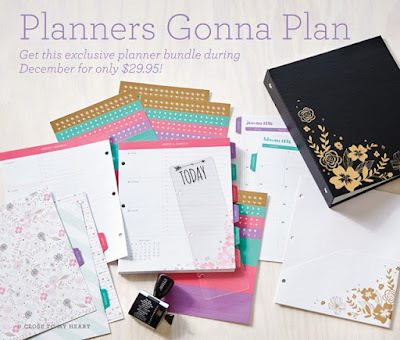 Who, on your gift list, would love a planner that serves a purpose and is a beauty?! This is a great week to check off people on your gift list, while saving some money or...go ahead...treat yourself to something. You have my permission! I pray you are reading this message in good company, with friends and/or family, taking in the goodness of all that is cookin' wherever you are. There are just certain things I wait to enjoy on this special day and I will be ready to indulge this afternoon (while watching Cowboy football, of course). I work daily to be mindful of my many blessings, even when life is fast and furious and throws challenges my way. I know I have much to be thankful for, too many to list in one sitting. Isn't that an awesome thing to say? God has blessed my life in so many ways, sometimes in ways that seem small but are key to making me who I am and who I was designed to be. Despite the hiccups along the way, I truly now it is all for a purpose even when the reason may not seem clear at the time. I am thankful there only has to be one day a year that serves as a reminder to all of us to be thankful for our many gifts, regardless of their size. Thank you for being part of my life. 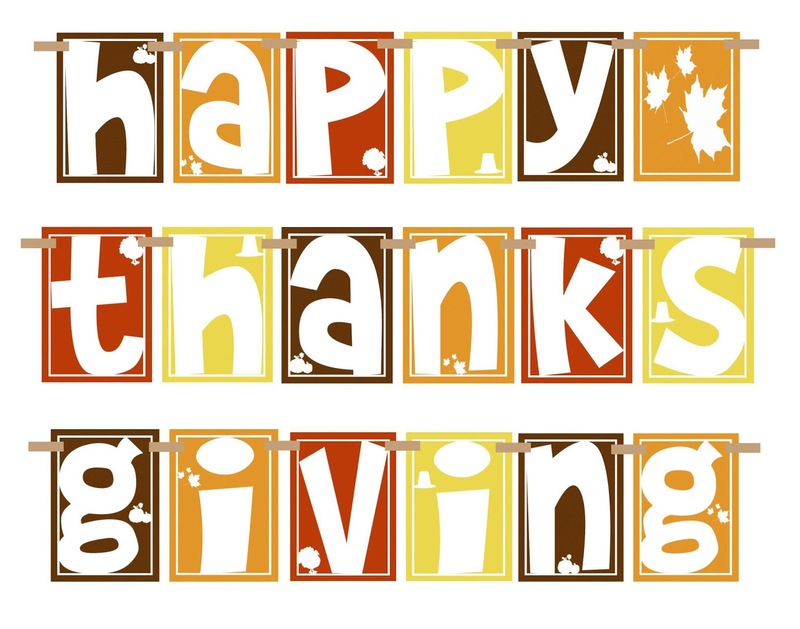 I am thankful for YOU and wish you a day full of blessings, laughter, belly laughs and lots of food. It will also include football for me! 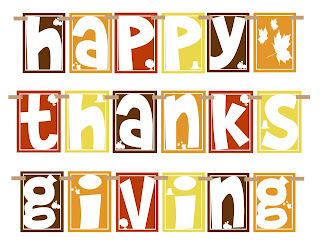 :) Happy Thanksgiving. 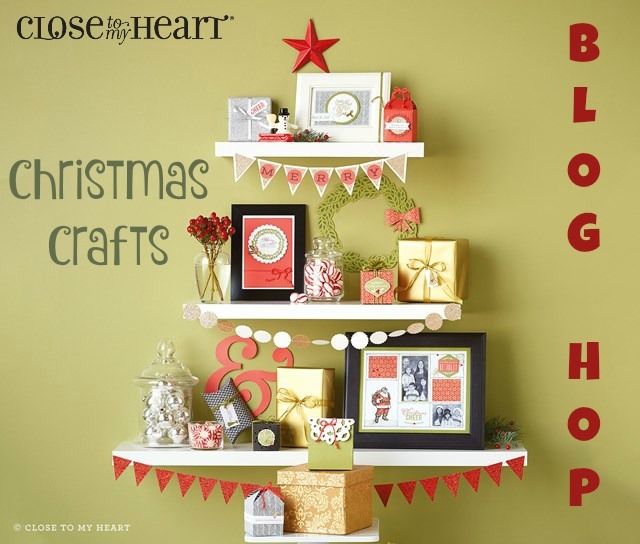 Welcome to our Blog Hop where we are featuring Christmas Crafts made with Close To My Heart products. Do you have people on your list who are challenging to buy for? I do and when that's the case a thoughtful gift, in perfect packaging, usually does the trick in putting a smile on their faces. If you are coming from Aggie's Blog, you are on the right track. A complete list of participants is provided at the end of this post. Let's get this fun started! I fell in love with these Pint Containers when they were first released this summer at Convention. I decided to pull one out and decorate it for this hop, recognizing they are perfect for filling with goodies - cookies, chocolate, socks, smell goods, etc. They are a perfect size - not too big and not too small as Goldilocks would say. 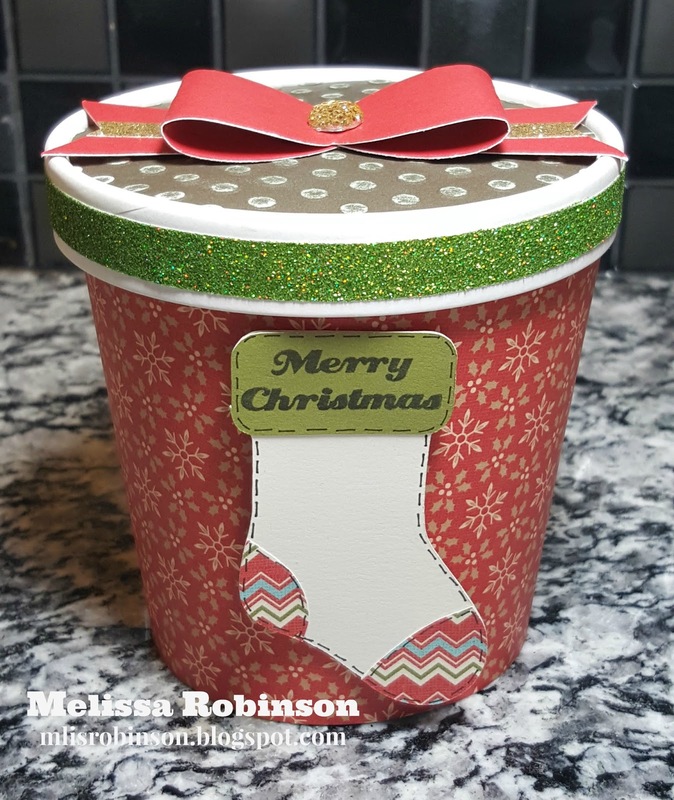 There are a variety of ways to decorate these containers. Because I wanted to cover mine in paper, and they are not a perfect rectangle because of their shape, I decided to take apart one container to make a pattern. (The pattern will be provided HERE - by noon today CST. I was forced to cut it into two pieces so you will have two seams, allowing it to print on standard-size paper.) I traced the pattern in this beautiful B&T paper from our White Pines paper pack. 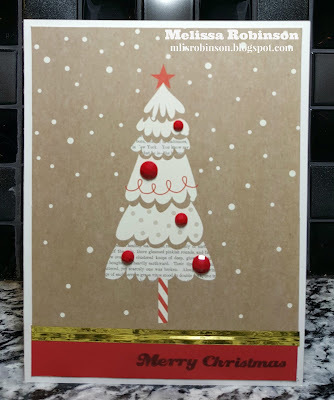 The stocking was cut from our Art Philosophy Cricut cartridge, three times - on Colonial White, Olive cardstock and the chevron patterned paper from White Pines. The colonial white stocking was used as the base and the other pieces were cut and glued on top. Green Shimmer Trim was added to the rim of the container, for some sparkle. 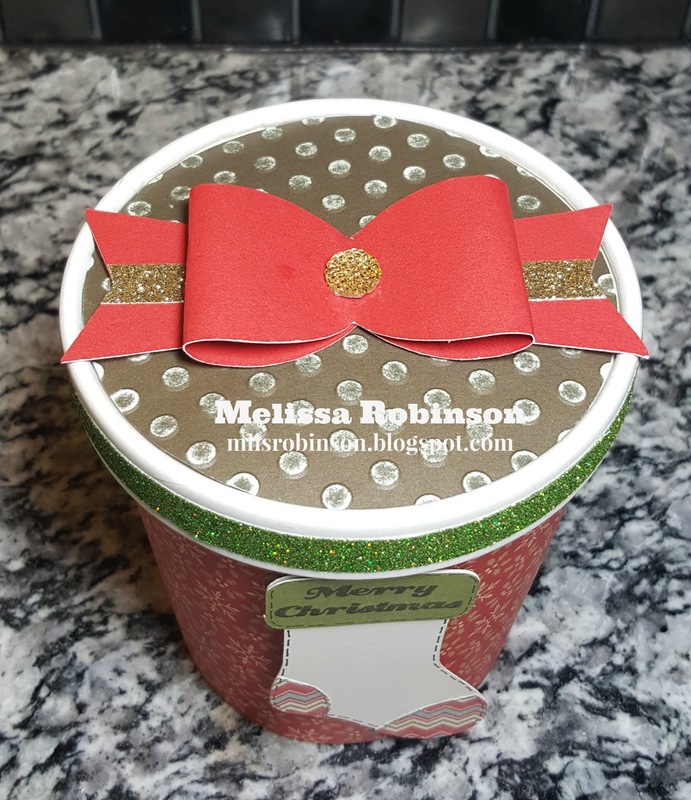 For the lid, I took a Cocoa piece of cardstock, cut a circle to fit and ran it through my Cuttlebug using the Dot Embossing Folder. For the added texture, I distressed it using our Sanding Block (from the Sanding Kit). The big bow was cut out of Cranberry cardstock, using the Artiste Cricut Cartridge. A Bling Gold Gem and Gold Shimmer Trim were added, for the finishing touch. I love how it turned out and cannot wait to fill it and gift it. If you would like to make one of your own, be sure to grab the pattern above. I would love to see what you create as well as what you decide to fill it with. What suggestions do you have for fillings? 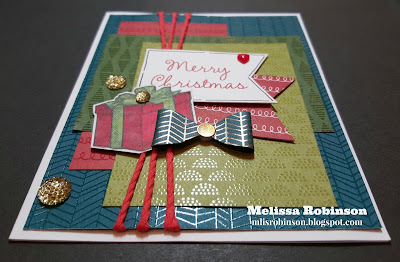 Now, how on over to Marianne's Blog to see her fun creation! Happy hoppin'! This week at Heart 2 Heart our theme is "Watercolors". I fell in love with the Close To My Heart Watercolor Paints when they were released, and we used them, at Convention this summer. I have enjoyed playing with them, realizing how forgiving they are and that you truly cannot do much damage with them. I have since used non-CTMH watercolors and I can say their quality does not compare. For my card this week, I simply painted these three colors on a piece of Watercolor Paper. I did brush water over the entire piece before adding the color. 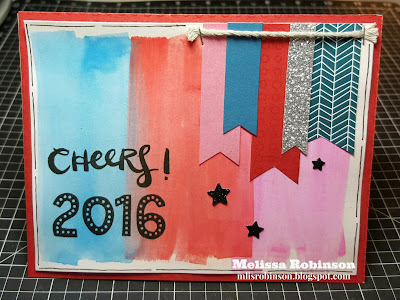 The sentiment was stamped with Black Ink, and comes from the November Stamp of the Month, "Cheers, 2016!" Consider linking up to us and showcasing artwork with watercolors. 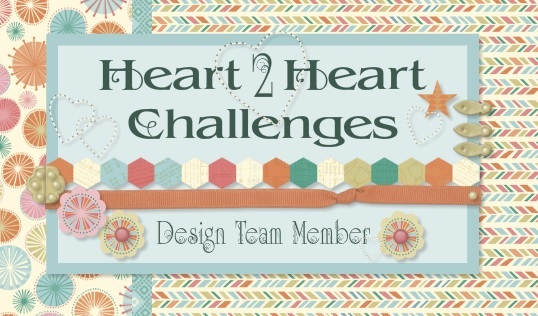 We love to see your beautiful and fun creations so head on over to Heart 2 Heart Challenges and join us there! Enjoy the rest of your week and don't forget to Make It From Your Heart! Members of the Stampers with an Attitude Team, with Close To My Heart, are highlighting the White Pines paper pack this month. This product line has several coordinating options that you will want to be sure you get. If you are coming from Catherine's Blog, you are on the right track. She always has fabulous artwork, doesn't she? Should you get lost along the way, you can find a list of participants by clicking HERE. 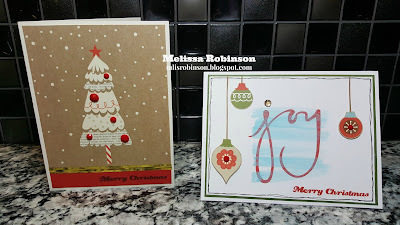 These are two cards I made using...card from the White Pines Picture My Life Scrapbooking Program! I am so proud of myself and love how they came out. I hope you love them too! 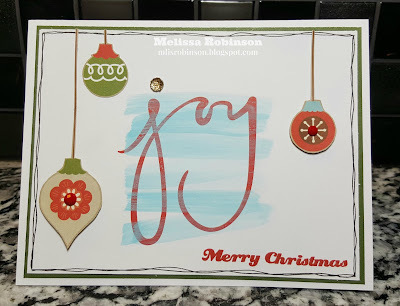 For this card, which only contained the word "joy", I added some light blue water color to the sentiment. Then, I took these ornaments from another card, fussy cut them and added them to the card front. 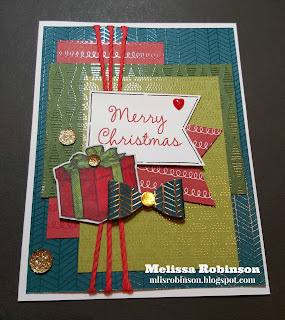 I stamped Merry Christmas in Cranberry and of course, added some bling to various places. The focal point is layered on New England Ivy, although not easy to recognize from this photo. This card was trimmed to fit the front of the card base. 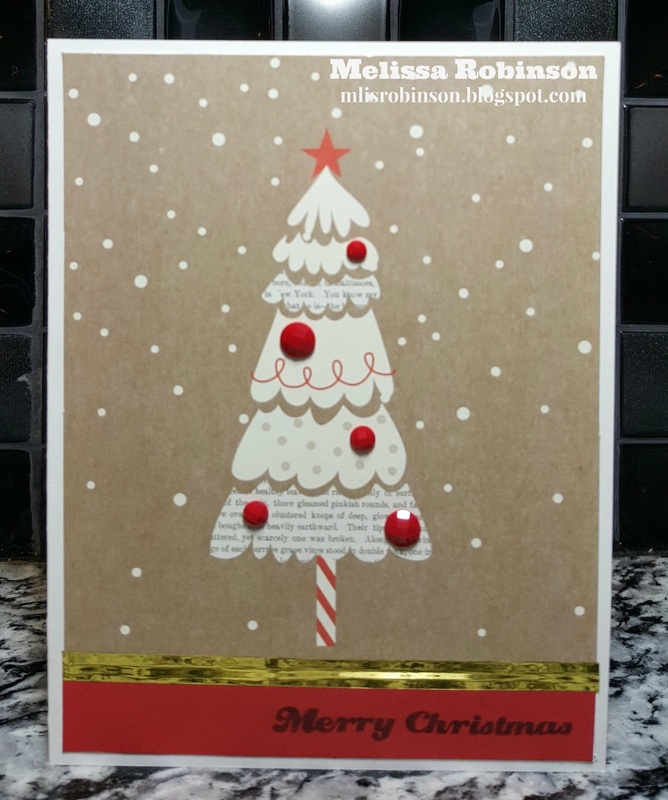 A piece of Cranberry cardstock was added at the bottom and Gold Foil Tape was placed along the seam. Red Enamel Gems were added on the tree and Merry Christmas was once again stamped. Please consider leaving a comment and then head on over to Tammy's Blog and see what she has to share with you. Thanks for stopping by and happy hoppin'! We have a fabulous campaign this month where you can get plenty of scrapbooking products for a great discount! This product line is absolutely fabulous and this is a great time to get it in your hands! You can click HERE for all the details and then contact your Consultant to place your order. If you are coming from Shirley's Blog, you are on the right track. You can find a list of all participants at the bottom of this post. Here is an angled photo that shows the texture a bit more. The gift package came from the "Believe in Christmas" stamp set. I used a marker chart, provided by our Art Department - click HERE to get your hands on it, to create colors that coordinate with our palette hues even though we do not have exact ShinHan markers to match. Doesn't it look great?! I take no credit for it other than adding the colors as indicated. LOL But...it was totally cool to see the colors blend together! 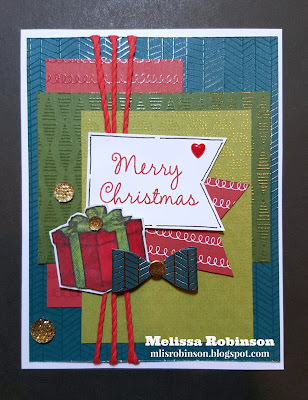 The bow was added from the Fundamentals Assortment and a Red Enamel Heart and three Bling Gold Gems, plus some Poppy Twine, helped glitsy up this card. 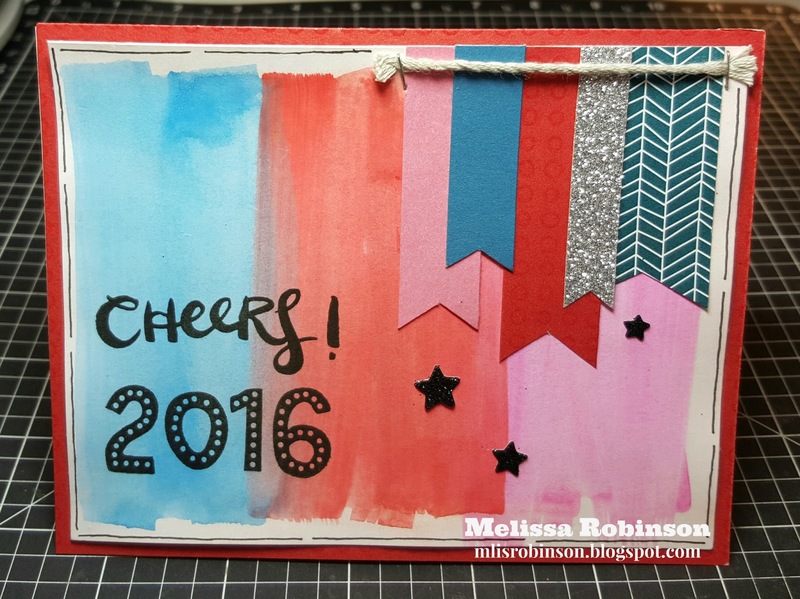 I used this card/post for inspiration for this card. Let me know what you think of my artwork - I always love hearing from you - and then head on over to Darlys' Blog to see what she has in store for you. Thanks for stopping by and always remember to...Make It From Your Heart! Happy Saturday! No better way to get this day started than viewing this fabulous video highlighting Close To My Heart's Everyday Life Planner that is soon to be released! We are sitting on the edge of our seats waiting for that day! I was able to see this beauty in person, so if you have any questions, let me know. While I cannot take pre-orders, you can let me know you want one as soon as they are released and I will contact you as we receive notice These are great for personal use but wouldn't they also make great Christmas gifts that are cute AND purposeful?! Please share this information with your friends. If someone, who is not already a customer of mine, orders one from me and gives me your name as a reference, I will have a special goodie for you! Enjoy this beautiful Saturday, wherever you are, and don't forget to Make It From Your Heart! Close To My Heart on Creative Live Webcast Next Week! Close To My Heart and some of my dearest friends, who work at the Home Office or are fellow Consultants, will be on Creative Live next week with two full days of broadcasting and you should join them/us! Information about the company and our products will be shared as well as a full project! 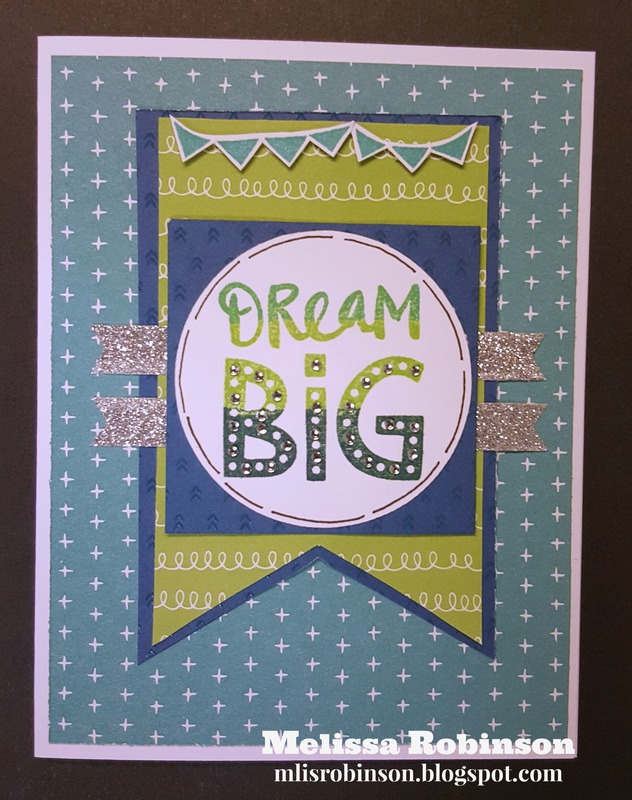 It's a great time to gather with your papercrafting friends or work on your creative projects while being inspired. (The broadcast will also be recorded for review at a later time.) The information is a little distorted in this post, and how it appears on my Blog because it was copied and pasted. For a more professional view, click on the link below. Some information is contained below and here is a LINK TO REGISTER. creative ideas for celebrating the relationships that matter. Discover your creativity and celebrate the relationships that matter to you with the beautiful artwork of Close To My Heart! 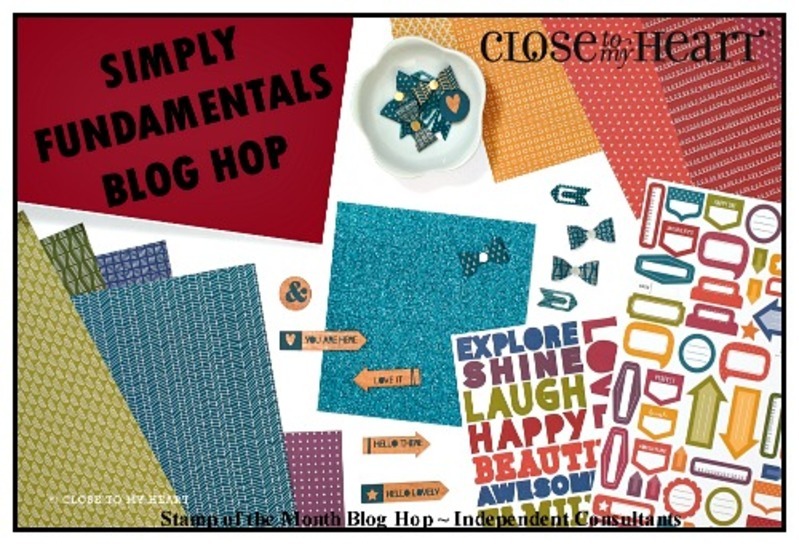 Close To My Heart, a leader in the scrapbooking and stamping industry, partnered with CreativeLive to bring you Scrapbooking, Paper Crafts, Stamping and More!. During this unique event, you’ll learn how to use the Close To My Heart products to create beautiful scrapbook pages, customized cards, handcrafted home décor, inspired digital designs and more! 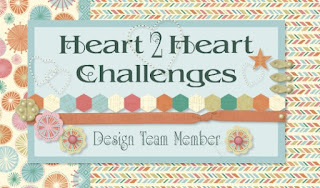 You’ll get dozens of inspiring project ideas as Consultants and staff members show you how to work with the complete collection of Close To My Heart Products. You’ll get instructions and advice on getting the most out of the Close To My Heartscrapbook supplies and Cricut embellishments, along with plenty of tips for good old-fashioned party hostessing. Whether you just want to create personal treasures or are ready to start a home-based business of your very own, Close To My Heart is the perfect partner for you. Close To My Heart produces high-quality and inspiring creative tools and accessories that are only available for sale through passionate and hard-working Close To My Heart Consultants. Tune in for Scrapbooking, Paper Crafts, Stamping and More! and find out how fun and rewarding being a Close to My Heart Consultant and customer can be! This class will be broadcast live and for free 9:00am - 4:00pm. Here is a copy of my newsletter that just went out a short while ago. (I did notice joined was a typo AFTER I sent it. It is corrected here. LOL) It does get a bit distorted as I copy and paste the newsletter here so you can click on this link to view it better. If you aren't subscribed to my newsletter, click HERE and then subscribe in the upper left-hand corner. Would love to hear from you and hope you are having a TERRIFIC Thursday! I am celebrating 17 years as a Close To My Heart Consultant! On October 20th I celebrated 17 years as a Close To My Heart Consultant! That's right, I joined in 1998 and am still loving this fabulous company, the awesome products, and the relationships I have enjoyed because of that decision made that long ago. I am thankful to Jeanette Lynton, our creator and CEO, for having a vision for this awesome company and building it in a way that would impact my life as it has. I have enjoyed fun times with people I have met because of Close To My Heart, be it team members, customers, fellow papercrafters, or our home office staff. I have been blessed in so many ways. Thank YOU for being in my life and for sharing this art with me. I am truly blessed. We have some fabulous stuff happening this fall at Close To My Heart so be sure to read all the details below. I would love for you to join me at an upcoming class, even if you purchase a kit-to-go. I just returned from Salt Lake City where I attended the Close To My Heart Album Retreat and shared in this experience with several of my dearest friends. We made an entire album of 23 pages, with photos and journaling (most of it) over the weekend. I HAD A BLAST! Having never been able to attend this event in the past, I truly enjoyed it and will return again. 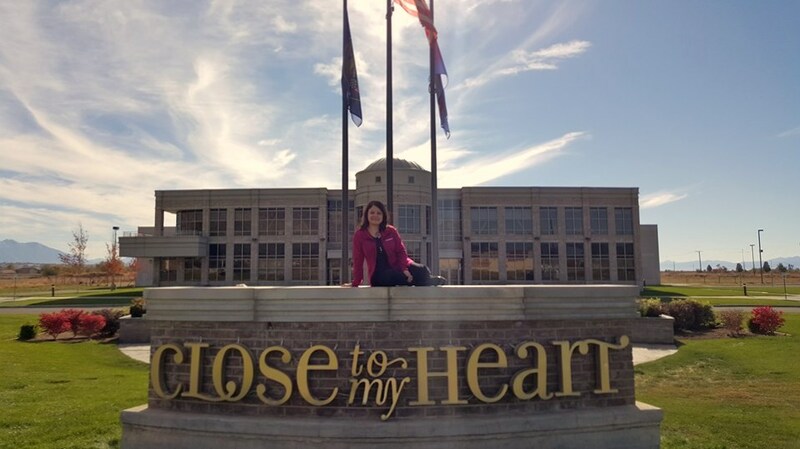 We did extend our trip and were able to get out to check out the sights and scenes of Salt Lake and the surrounding areas, including the Close To My Heart home office. Being able to take this photo was so AWESOME! Be sure to watch my blog - My Heartfelt Sentiments - for CTMH artwork as well as fun and informative information I share regularly. You don't want to miss out on a thing! Or...follow me on my Facebook Business Page where the blog posts also appear. I love connecting with and hearing from you! It makes my day! In fact, read through this newsletter and email or text me (contact information below) and let me know if you have any questions or just to say 'hi'. When you do, provide your mailing address and I will stick a card and goodie in the mail to you. That will be the only reason for me to have your mailing address; for fun stuff now and later. :) I won't use it for any other reason. Enjoy the rest of your week and Make It From Your Heart! 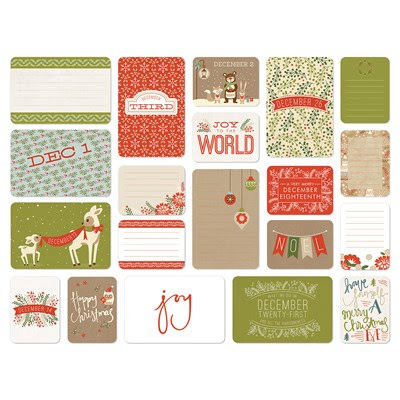 Save 23% on scrapbooking products this month! 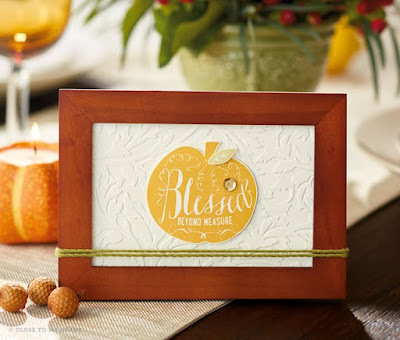 Experience the beautiful Simply Fundamental Scrapbooking workshop—available only during November! This workshop has been created using all the items featured in our campaign exclusive My Legacy™ album bundles, available during November for $71.80! With this special offer, you are saving 23% on these products as compared to purchasing these products separately. That is HUGE! 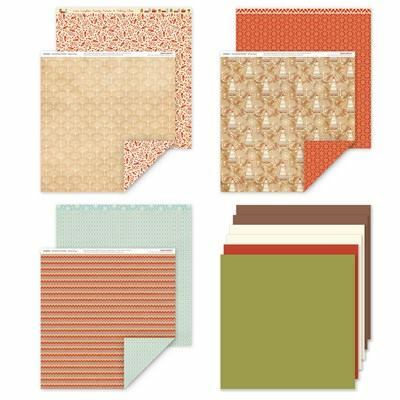 Once you receive these products you will be set to turn these beautiful products into fabulous layouts using the new Simply Fundamental Scrapbooking workshop featuring five layouts you can make using all the supplies in your bundle. 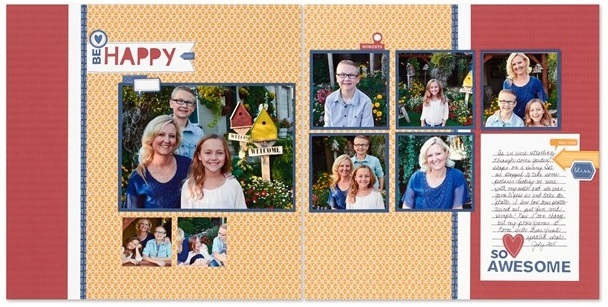 When you order a bundle, I will email you the directions for making thes layouts. 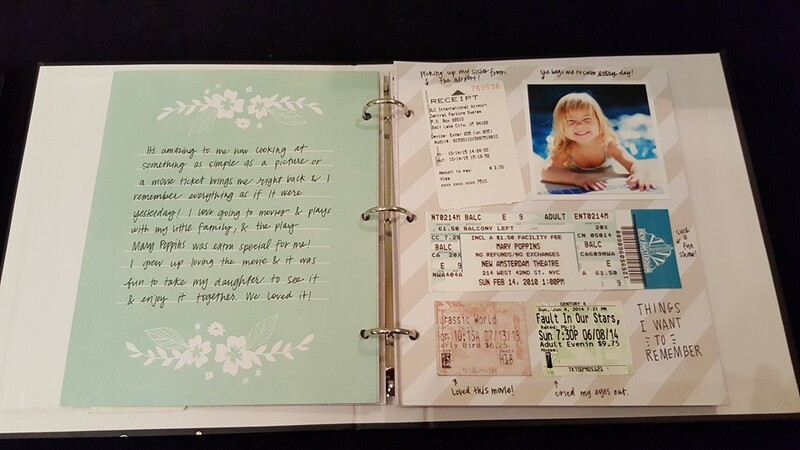 They are super cute, easy to assemble and perfect for preserving your memories. You can view all the bundle options, that vary by the album chosen (the Black Post-Bound album is out-of-stock and unavailable for this campaign), by clicking HERE. Let me know which bundle you want! 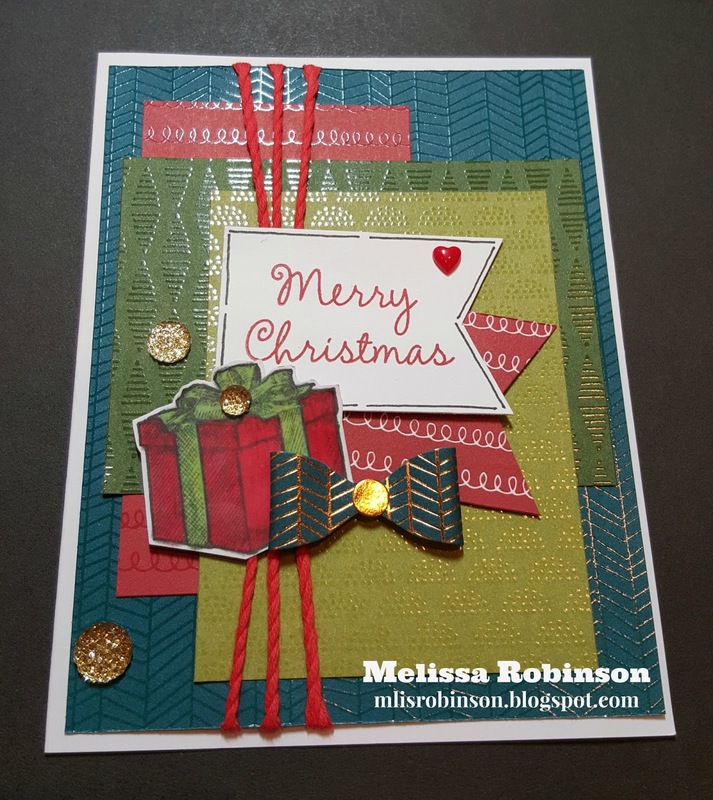 Order a card kit to arrive on your doorstep for easy assembly! The holidays are upon us and it's almost time to send out your Christmas cards. 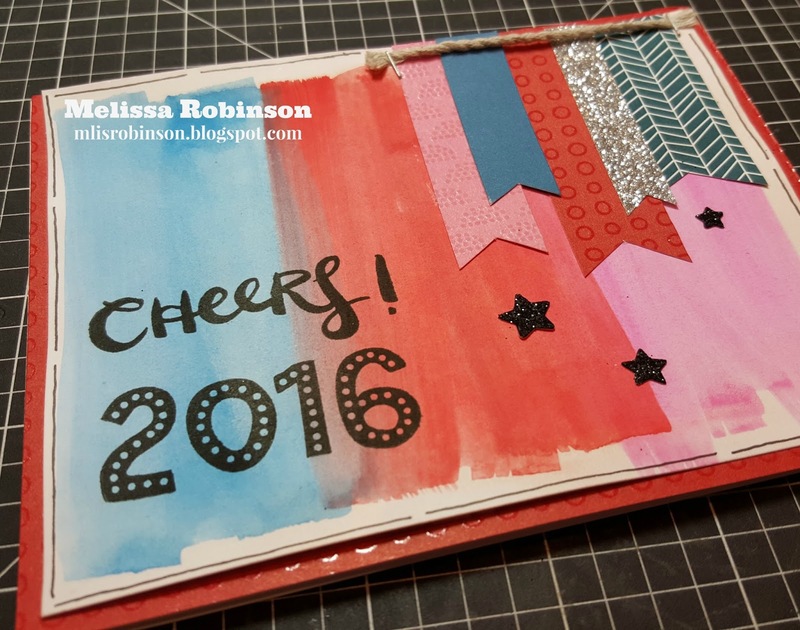 Why not make handmade cards this year? Or if you don't have time to make them, why not buy handmade cards from me that I'll make especially for you? 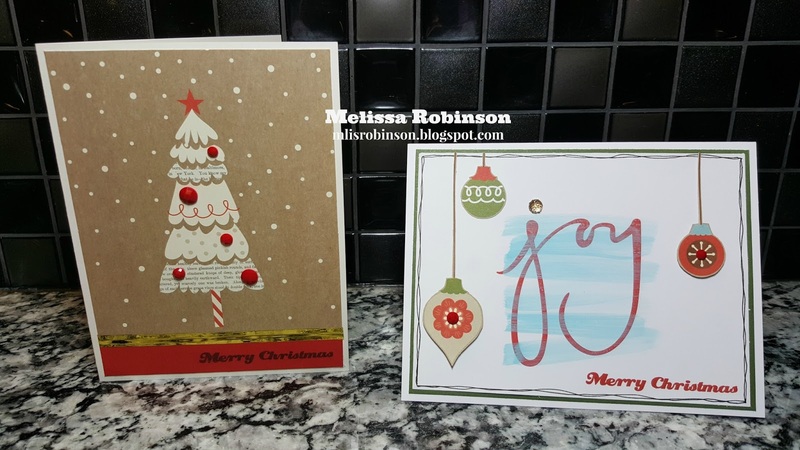 This kit is just $30 (includes shipping to me) + $5.95 shipping to your door and includes all you need to make 15 Christmas cards (5 each of these three designs) using the "Workshop on the Go Whitepines Cardmaking Kit". All pieces will be pre-cut, ready for you to stamp and assemble. If you want me to stamp your images*, I am more than happy to do so. If you prefer to order the Workshop on the Go Kit and start from scratch in assembling your cards, you are more than welcome to do that! You can order directly from my website and have it shipped to your door. This is what is included in the Workshop on the Go and it includes an exclusive D-size stamp set you can't get otherwise. 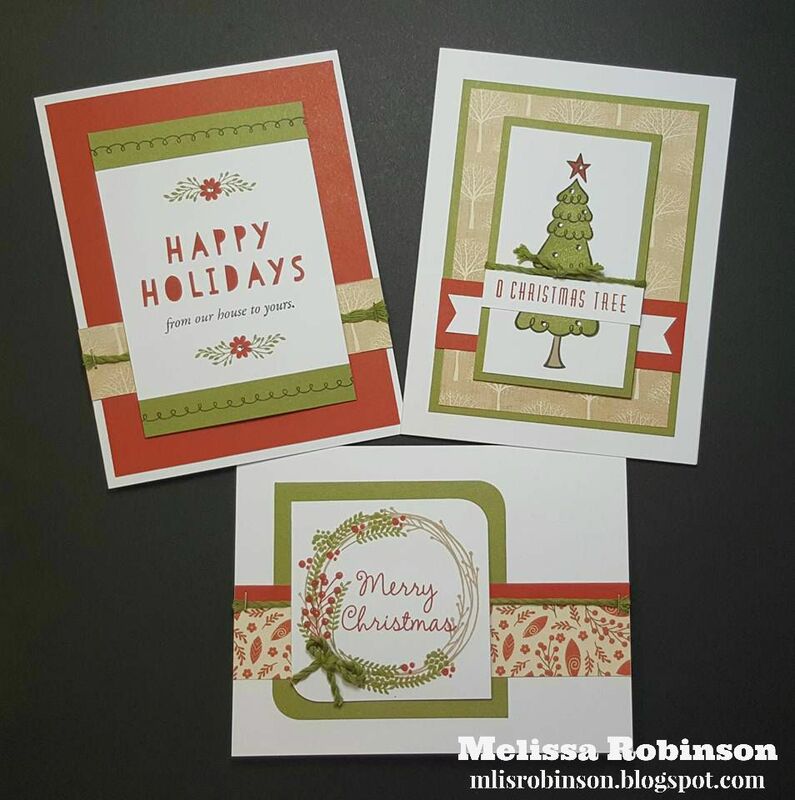 If you elect to stamp your own images, the inks needed are: Cranberry, Fern and Black. You may want to add them to your order if you do not already own them. Need more than 15 cards? I can help you with that. An additional 15 cards will cost just $20 or you can elect to pay $2 per card and let me know your choice of design from the three shown. Contact me with your interest and I will send you an invoice for payment. In order for you to receive these products in time for you to complete your cards and mail them out before Christmas arrives, please place your order by November 27th. If you would like for me to make the cards for you, they are just $2 each, plus postage to you, but there is a discount if you order at least 6 cards. 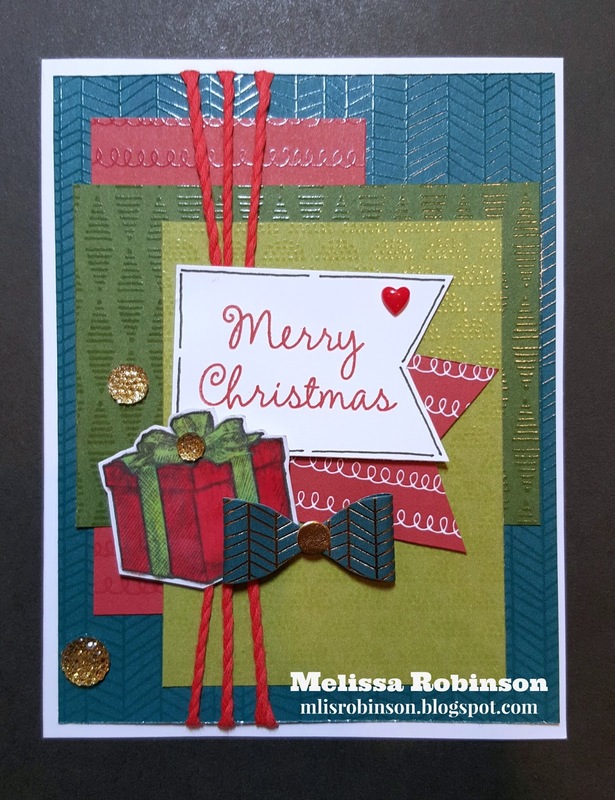 Order a greater quantity and I will make you an offer you cannot resist, allowing you to send beautiful, handmade cards to your friends and loved ones. I would appreciate your business! Get this for just $5! Isn't this stamp set CUTE?! I love it for so many reasons but it will obviously be great for the new year! I have sent out New Year's cards in the past to some friends and family members (takes the pressure off of making and sending a lot of Christmas cards if time does not allow) and know this stamp set will be perfect for doing so. I can also totally see this used in our new planner (continue reading for those details). 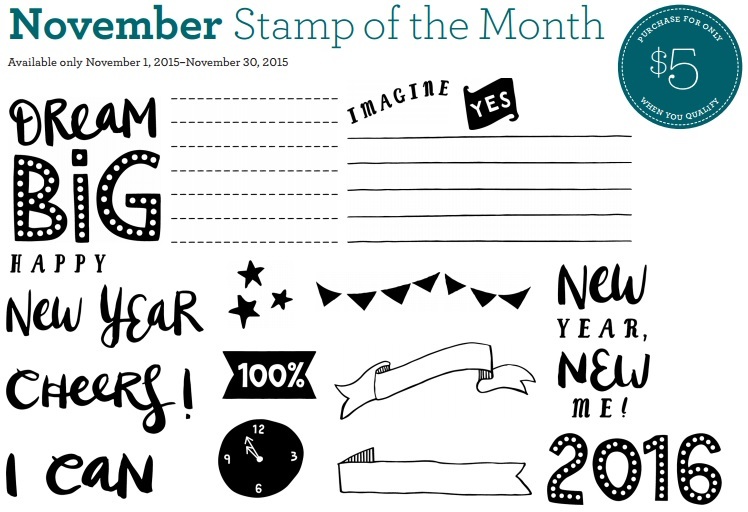 This stamp set is only available through the end of this month, while supplies last. It is valued at $17.95 and is yours for just $5 with a $50 purchase. You can find details by clicking HERE. Everyday Life Planner COMING SOON! Have you heard?! Close To My Heart has shared a brand new product that will be released very soon! 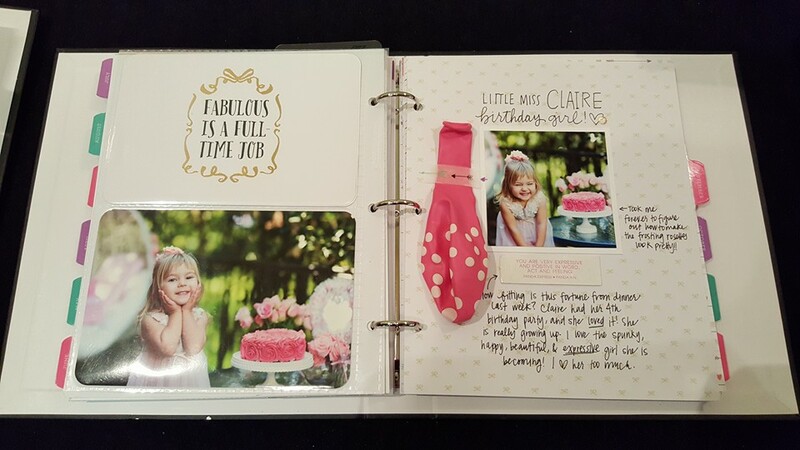 It's called the Everyday Life planner and was announced at the Australasia Convention last month. 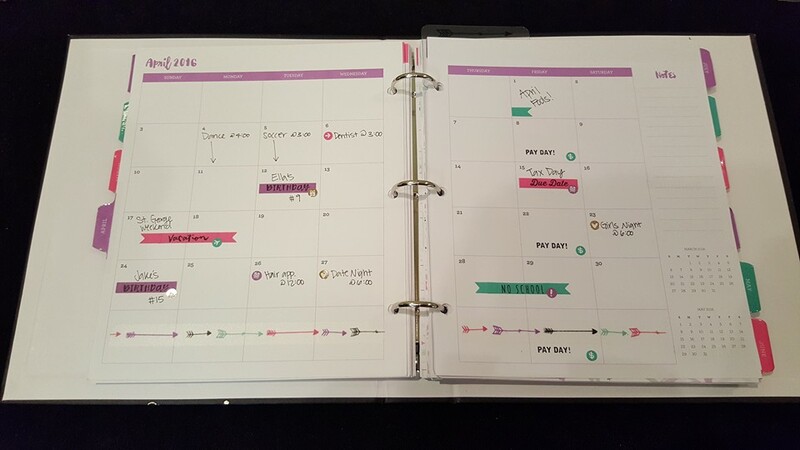 The Everday Life line introduces multiple products that work together seamlessly to create a planner, a My Crush book, or a product of your own creation. The Everyday Life 2016 planner pages ($15.95): 154 planner pages, 12 monthly dividers with tabs, a pocket folder page, a designed page finder, and four sheets of stickers. With monthly and weekly spread and printed dates, these pages have all the features you need to stay organized - and look good doing it! Everyday Life Perfect Plan roller stamp ($8.95): This fun and functional roller stamp coordinates perfectly with the label stickers, enabling you to customize your planner even further. 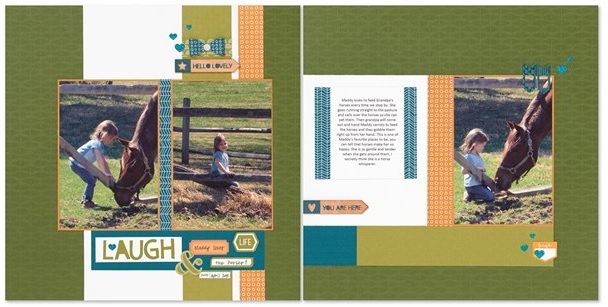 My Crush Everyday Life pages ($7.95): A set of 60 double-sided, gorgeous My Crush pages. 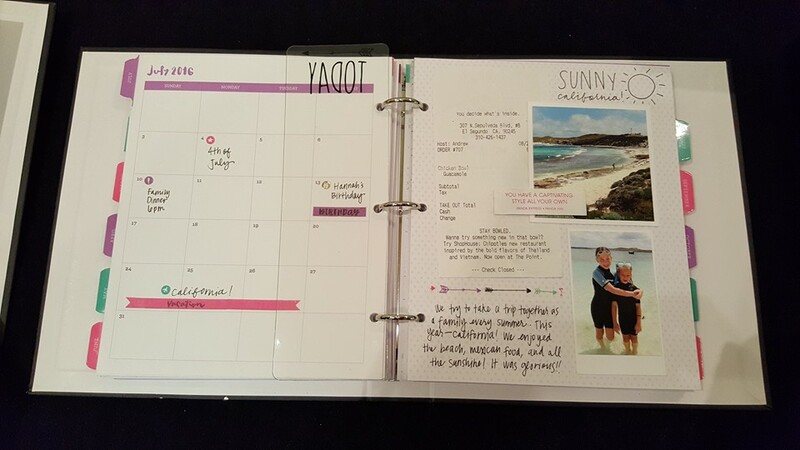 These pages can be used on their own to create a beautiful My Crush book, or they can be combined with the planner pages to give you more room in your planner for preserving your memories while giving your planner even more flair. Everyday Life Washi Tape ($3.95): because every My Crush book needs a good washi for attaching photos and other memorabilia to your pages. 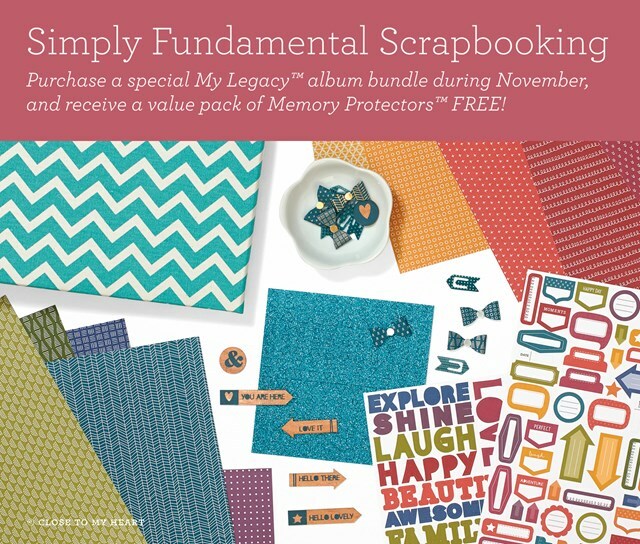 Memory Protectors ($4.95): we're introducing two new styles of pocket memory protectors sized to fit into the Everyday Life album. One will have two 4" x 6" pockets, the other four 4" x 3" pockets. Use these to add your favorite Picture My Life cards and photos into the mix! Altogether, the Everyday Life line gives you ultimate flexibility in creating a planner/My Crush book/pocket album uniquely customized to you. Most of these items are expected to be made available later this month, with the exception of the washi tape, which will be available mid-December. 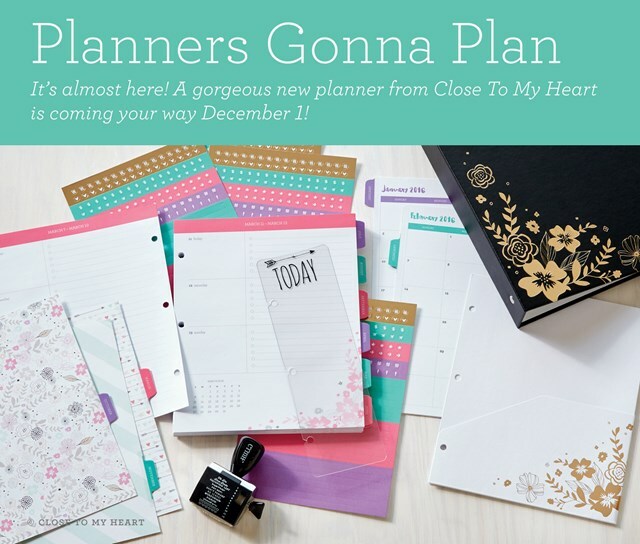 To add even more excitement, Close To My Heart will be offering a discounted bundle for purchasing the album, planner pages, and roller stamp together for just $29.95 - a 15% discount off retail value! Isn't it just fabulous?! I will be ordering one as soon as they become available! If you would like to do the same, let me know and I will contact you as soon as they are released! This is perfect for you preparing for the new year and also would make a great gift for everyone! I would love your business this holiday season! Copyright © 2015 Close To My Heart Independent Consultant, All rights reserved. Have you heard about our fabulous campaign is this month? It's called "Simply Fundamental Scrapbooking" and you get a great discount on a scrapbooking kit that includes many of our top selling products. You can click HERE for all the details and then contact your Consultant to place your order. If you are coming from Sheila's Blog, you are on the right track. You can find a list of participants by clicking HERE. 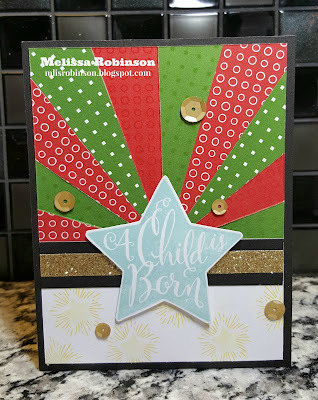 While the focus of this campaign is scrapbooking I know you are bound to have some scrap pieces of paper and this card is perfect for just that. I used two 4" x 4 1/4" pieces of paper from the Paper Fundamentals, one of each color (Topiary and Cranberry). The strips were then cut in diagonals and placed accordingly. Feel free to search the "starburst" technique on YouTube. There are plenty of videos out there. The method I use is super simple. 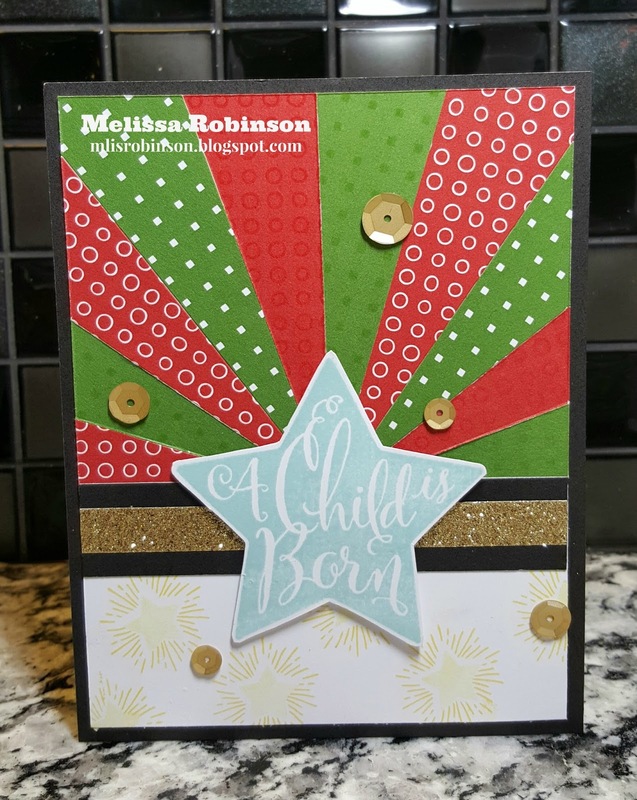 The "Christmas Star" stamp set was used for the focal point/sentiment, inked up in Glacier. There are star bursts in the stamp set and I used Canary for them. And you know me...some Gold Shimmer Trim and Gold Sequins were the finishing touch. I hope you like the result. I sure do! Thank you for hopping with us. I always love reading comments so please consider doing so and then hop on over to Wendy's Blog and see what she has in store for you!